The Fuego Volcano in eruption, seen from Alotenango municipality, Sacatepequez department, about 65 km southwest of Guatemala City, on June 3, 2018. Guatemala's Fuego volcano has erupted again, sending rescue workers and survivors scrambling for safety Tuesday afternoon. The national disaster agency ordered evacuations as new flows of ash, gas and rock spewed from the volcano. Seismic events also rattled the area. The new eruption spread panic as residents fled areas that had not been under evacuation warnings. Guatemala's seismology and vulcanology institute's latest bulletin said Tuesday's eruption could send ash 6,000 meters above sea level, causing a danger to air traffic. ​Earlier Tuesday, Guatemala began burying the few dead who could be identified after Sunday's cascade of lava, gas and rock fragments killed at least 72 people and covered nearby villages in thick layers of ash and mud. Local television footage showed mourners walking through the streets, caskets hoisted on their shoulders. As rescue workers continued the search for survivors, authorities increased the death toll as more bodies were pulled from the debris around the hardest-hit villages. The number of casualties is expected to rise. Disaster officials said the eruption Sunday affected more than 1 million people, with 3,265 evacuated from areas around the volcano. Crews are assisting people in Escuintla, Sacatepéquez and Chimaltenango provinces, and carrying out search operations for people who are missing. The director of Guatemala's National Institute of Forensic Science said 17 victims have been identified. Temperatures of the lava flows reached as high as 700 degrees Celsius, making identification extremely difficult. 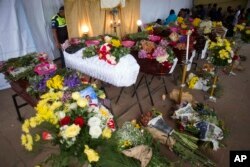 Flower-covered coffins of seven people, who died during the eruption of the Volcan de Fuego, which in Spanish means Volcano of Fire, stand in the main park of the town San Juan Alotenango, Guatemala, Monday, June 4, 2018. "We're having a lot of trouble identifying them because some of the dead lost their features or their fingerprints. We're going to have to use other anthropological methods and, if possible, take DNA samples to identify them," Fanuel Garcia said. Planetary geosciences professor David Rothery of Britain's Open University in Milton Keynes told VOA that tiny rock fragments known as hot ash normally rise in the air and form a gas column, but in this case were too dense and ended up cascading down the mountain. "This stuff goes over a hundred kilometers an hour. The base of it is very hot and you don't want to be caught in that. You're dead, it's so hot it sweeps past you, you die," Rothery said. "It was fast-moving pyroclastic flows and people don't seem to have been aware of the hazard." Fuego is located about 44 kilometers southwest of the capital, Guatemala City, and is close to the city of Antigua, which is a popular tourist destination. Margaret Besheer at the United Nations and Victor Beattie contributed to this report.